It did take me a while to get into this book; I think it was mainly due to War of the Roses series by Conn Iggulden. It’s hard to come away from a series as perfect as that. I’m only going to say this once (probably many times throughout this review), I LOVE THIS SERIES!! Sarah J. Maas is officially my favourite author. 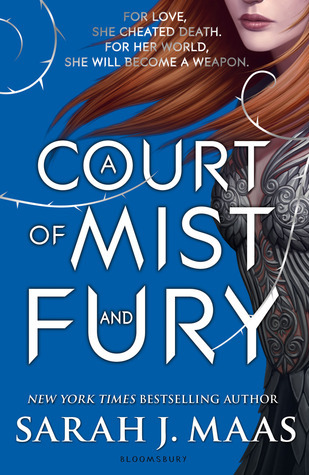 The world building, the characters, Feyre, everything was just perfect. I didn’t and couldn’t put this book down. I don’t want to spoil it for those who haven’t read the book yet, but if you have seen reviews or everyone talking about how much they hate Tamlin, read this and everything will be explained. Actually, it took me to the end to really, truly hate him. Throughout I could understand where he was coming from (kind of), even if it was the wrong thing to do. But what was revealed at the end, I’m with the girl who wrote in her review, I hope he dies hahaha. So, it brings me to Rhys…PERFECTION! I could go on and on about how much I want Rhys, but I’ll probably sound a bit creepy by the end. So, let’s just leave it at that. And let's not forget about the inner circle...I wonder if they have an opening for me? Bring on 2nd May. Cannot wait to read the next installment.